DAKAR (Reuters) - Violent protests against Ebola controls in a north Guinea town have prompted the Red Cross to withdraw workers, undermining efforts to stop the spread of Ebola into neighbouring Guinea Bissau. The Ebola epidemic was detected in Guinea over a year ago and has since killed more than 11,000 people in West Africa. But in a huge relief to officials and aid workers, it has not yet spread to Guinea Bissau, whose health system is deemed vulnerable even by low regional standards. Now, a spike in new cases in Guinea's Boke border province combined with violent resistance to efforts to control it there are stoking concerns it could spread. Boke had reported no Ebola cases for months and then reported six cases within a fortnight in May, resulting in a list of more than 230 people deemed at risk of catching the haemorrhagic fever, according to the World Health Organization. On Friday, an angry crowd attacked a police station and public buildings in the Boke's Kamsar after aid workers sought to identify a woman believed to have been in contact with an Ebola patient, residents said. Anti-Ebola protests continued over the weekend and security forces were sent to the town to restore order, locals said. Two Red Cross cars and an employee's home were attacked while a warehouse containing equipment for safe Ebola burials, seen as critical to containing the virus, was incinerated. "This attack...impedes attempts to stop the epidemic from spreading and to trace those who may have come into contact with an infected person," said Corinne Ambler, regional communications coordinator at the International Federation of Red Cross and Red Crescent Societies (IFRC). Ebola cases have fallen sharply overall in Guinea in recent months although resistance to an anti-Ebola campaign still hampers efforts to stamp out the virus as nearby Liberia has. Ambler added that she was "very concerned" that Ebola could spread from Guinea to Guinea Bissau. A November WHO report characterised Guinea Bissau's health system as "fragile", saying its laboratories could not even diagnose the Ebola virus. Already the WHO says a person who attended an Ebola funeral in Boke is thought to have returned to a fishing community in Guinea Bissau, where many Guineans commute to daily. 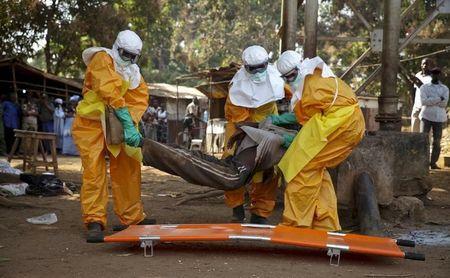 The IFRC has sent a team of experts there to reinforce anti-Ebola measures, it said.